Albert Papyan is a charismatic man from the town of Ijevan. In December, he will be 80 years old. Despite his infectious spirit and lovable smile, Albert has experienced a lot of tragedy the past few years. His son, a soldier who was serving in the war against Azerbaijan, was sadly killed in battle. About the same time Albert began having problems with his eyesight. He had developed advanced cataracts and by the time he visited the EyeCare Project he was completely blind. Before our Regional Eye Clinic opened in Ijevan, residents who lived outside of Armenia’s capital would either have to wait until our Mobile Eye Hospital reached their town, which could take several months or longer. Or, they could travel to Yerevan for care, but that is something that is out of reach for most patients because of the cost. Because it takes the Mobile Eye Hospital two years to do a full rotation of the country Armenians have to wait a long time for care. It was clear that residents needed regional eye care facilities near them that are available year-round. In 2015, the EyeCare Project launched our most ambitious program to date — “Five for Five.” We began developing five Regional Eye Clinics throughout Armenia for $5 million in five years. The locations, based on need, were selected by the Ministry of Health. 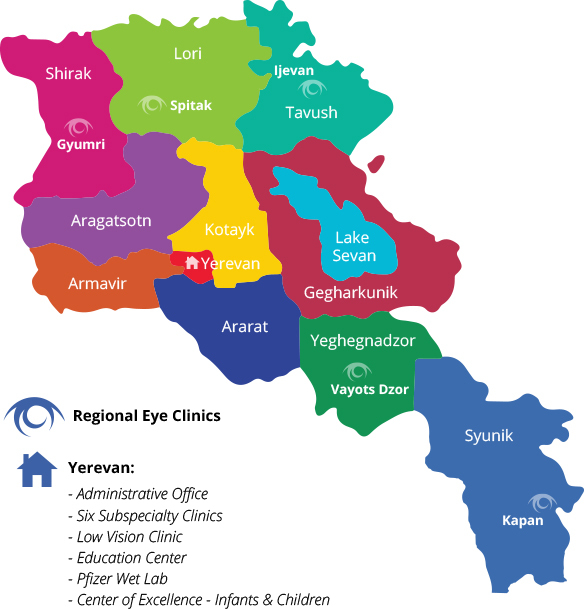 The first center, the Haig Boyadjian AECP Regional Eye Clinic, opened in Ijevan, Tavush in 2015; the John and Hasmik Mgrdichian AECP Regional Eye Clinic opened in Spitak, Lori in 2016; the Kapan Regional Eye Clinic opened in Kapan, Syunik in 2017 and the John Ohannes Khachigian AECP Regional Eye Clinic will have its grand opening in Gyumri, Shirak in September 2018. The fifth Regional Eye Clinic, which will be located in the Vayots Dzor Province, is scheduled to open in 2020. Albert was thrilled when he learned about the EyeCare Project and our Regional Eye Clinic in Ijevan. He couldn’t believe there was a state-of-the-art eye care facility in his town. At the clinic, Albert was able to have the cataract surgery he desperately needed to regain his sight and his doctors say the results have been amazing. Albert has regained 100 percent of his vision. “As soon as the patch came off, I realized I was able to see,” said Albert. “My eyes can really see! I’m so happy.” Albert is very appreciative for the EyeCare Project — which did the surgery at no cost — and for the doctors and donors who together were able to make his surgery at the Regional Eye Clinic possible.